Are Observed Radio Bursts An Alien Propulsion Technology? Harvard astrophysicists wonder if it could be worth examining a set of fast radio bursts to see if it could be evidence of an alien propulsion technology. "Captain, look," he said, and threw a plot of the local stellar region on the screen. "The intruder came from here. Whoever launched it fired a laser cannon, or a set of laser cannon - probably a whole mess of them on asteroids, with mirrors to focus them - for about forty-five years, so the intruder would have a beam to travel on. The beam and the intruder both came straight in from the Mote. See the entry for laser cannon from Niven and Pournelle's novel. However, this is not the earliest instance of this idea. 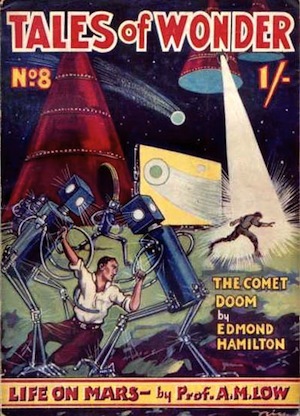 Golden Age science fiction great Edmond Hamilton wrote about ships propelled by light pressure in his 1929 story The Comet Doom. Via Harvard Center for Astrophysics.